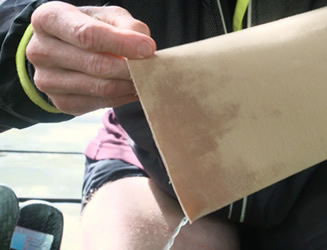 Modern liner technology provides excellent cushioning, but the impermeable and insulating material can allow a build-up of warmth and moisture. Interface liners with vacuum suspension are widely considered to be state-of-the-art in socket technology. 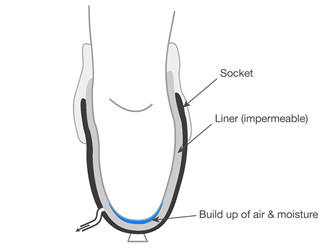 While vacuum systems expel air from between the socket and liner, the liner itself is made of an impermeable material, meaning air and moisture become trapped between skin and liner. Over the course of a day, sweat will start to build up, acting as a lubricant. Over time, the limb will start to move relative to the liner, causing discomfort for the amputee and reduced control. The additional movement of the residual limb can lead to increased relative movement and pistoning. This results in reduced ground clearance, compensatory gait patterns and increased energy expenditure, as well as creating an ideal breeding ground for bacteria. The impact of sweat between the skin and liner includes chafing and skin breakdown resulting in socket discomfort, loss of security and a less symmetrical gait. There is a greater risk of trips and falls, as well as the inconvenience of having to stop and refit the liner throughout the day.